I ran the 1/2 Sauer – 1/2 Kraut Half-Marathon on Sunday. I wrote a little about it here. Here’s a more detailed recap. First … Justine if you read this (I hope, I hope!) how are you? It was great meeting you at the race – good job on your first half-marathon! So sorry to hear you were taken to St. Joseph’s Hospital after you finished because you almost fainted. Would love to hear from you! I ran the first five miles in my Vibram Five Fingers. A number of runners asked me about running in them, so here’s my take. I’ve been running in Vibrams since January. I was inspired to try after reading Born to Run. I started slowly, only doing 1/2 mile at first. I gradually built up my mileage in them – backing off whenever my calf ached from them. Yes, calf, not calves … I have no pain in my left calf when I run. I think some of that is because some of the nerves in my left calf have been cut, so areas of it are numb – so it might hurt, but I don’t feel it. Also, I might subconsciously favor my left leg, though I’ve been trying not to. On the other hand (or foot) …. I have some pain in my right calf when I run. It looks ‘okay’ but it was also severely bruised inside. It has areas/lumps of scar tissue at a number of places. And I have a rod in my right femur because it was severely fractured, so I wonder how much that affects it. Cool extra bonus I’ve had since wearing Vibrams … I still had a few ‘sleeping’ nerves on my left foot – they weren’t cut when I was injured, just damaged. The top of my foot and two of my toes were still numb (6 yrs post-accident) Since running in the Vibrams, those nerves are waking up. I have tingling sensations on the areas that were previously numb. I think it’s due to the fact that each of my muscles in my foot and toes has to work, they aren’t protected by a shoe. Though it has been and will be painful at times, I’m thrilled that more nerves are waking up … the more, the stronger my foot will be. 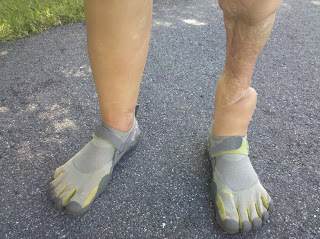 Since I had only trained up to five miles in the Vibrams, I didn’t trust wearing them longer at the race. My husband was meeting me at mile five with my sneakers. My feet and legs felt good in the Vibrams until about mile four. Going uphill I felt something pull in the front of my right foot. This area had been giving me some problems on my long runs, but nothing major. At mile five, I switched to my Nike Free sneakers, which I’ve been running in for a few months and love them. But in the past few weeks, my right foot has been giving me some trouble. So, I put new insoles in them and made sure to have new socks – but within the first mile of putting them on, the pain I had felt in mile four increased. Darn! I tried to ignore it. My friend and I planned to do the 13.1 miles in 8 minute running and 2 minute walking intervals. This was going great until around mile seven, I got chills, felt nausea and almost felt like I could faint. Guess temps in the high 80’s with humidity of 200% was getting to me. I had no choice but to slow up and walk more. I wrote about this here and some of you gave great suggestions as to what might have been going on. Thanks! Along with the heat and feeling lousy, the pain in my right foot increased throughout the rest of the race – so needless to say I was asking myself why I’m doing this in the first place – I could be home on the couch reading or tweeting! I had a headache and felt lousy for hours after the race … and had no desire to ever run a race again. Usually the day or two after a race, I hurt more than right after it. I was almost disappointed that my legs didn’t hurt more than they did on Monday and Tuesday, which meant that I could have pushed it harder as far as my legs were concerned. But feeling lousy sapped all my energy, so it was too hard to run faster or longer.